Two years ago I had a shoulder operation, a distal clavicle excision. It still isn't right. I have had constant tendonitis since the op and my shoulder is extremely unstable. HOWEVER, I am nearly 26 and I have not played a rugby match for 3 years. Having played to quite a good standard, no doubt losing ability in the 3 years out, my strength is also extremely shocking. Like many, I regularly go to the gym for around a month and then just stop going for a couple of months! My shoulder is painful on a daily basis and the lumps of osteoarthritis I had removed and cleaned up are certainly back on my ac joint. I am aiming to get my strength back up with a programme I have found from BokSmart. This offers a lot to the rugby player and the range of exercises are just what I need. I have started the hypertrophy programme at the moment and all is going well so far. It is hard work going to the gym, as I walk around 8-12 miles per day with around an extra stone and half of equipment around my waist. As you can imagine, legs would be the last thing I would want to do! I can feel myself getting stronger and my body shape is definitely changing, but the actual shoulder joint isnt getting any stronger or more stable! Nevertheless, I shall definitely be starting rugby again in the Autumn, hopefully going to preseason. Every two weeks my job requires me to work lates for two weeks and a Saturday so commitment is not something I can guarantee, so maybe playing for a seconds team would be preferable. I shall keep the blog updated with my progress. Be sure to check out the programme, you won't be disappointed with it. 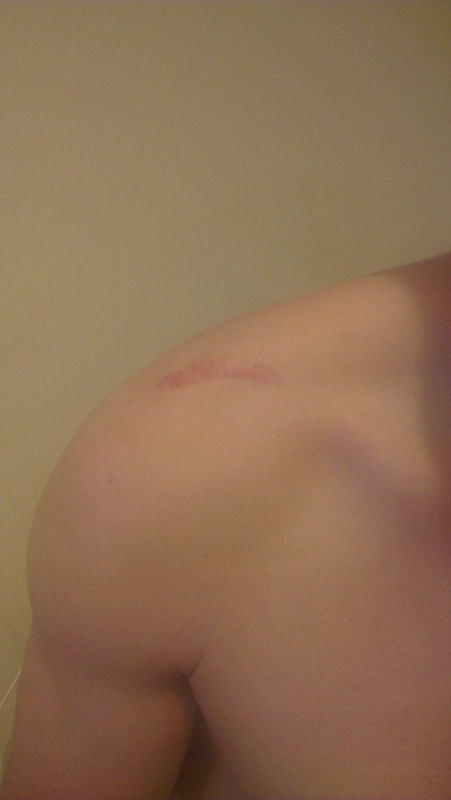 For now here is a picture of my lovely scar. Bear in mind they told me it would be keyhole surgery. Imagine my surprise when the bandage came off!